Because I fancy myself a writer, I like to think I am an introvert too, a craver of solitude. When the day-to-day of family life is particularly grinding, I’ve often used the evenings hours to google things like “cabin retreat” or “writing escape” with visions of myself alone in the woods with nothing but a calcified kettle and a rickety table for my laptop. Scrolling through the results, I actually deselect options like “WiFi” and “Close to Town” because apparently I’m the sort of person who wants to be alone for days and days so I can write. But, I’m not. On a windswept weekend in June, I left my gaggle of children with my brave husband and boarded the ferry from downtown for the 10-minute ride to Toronto Island. 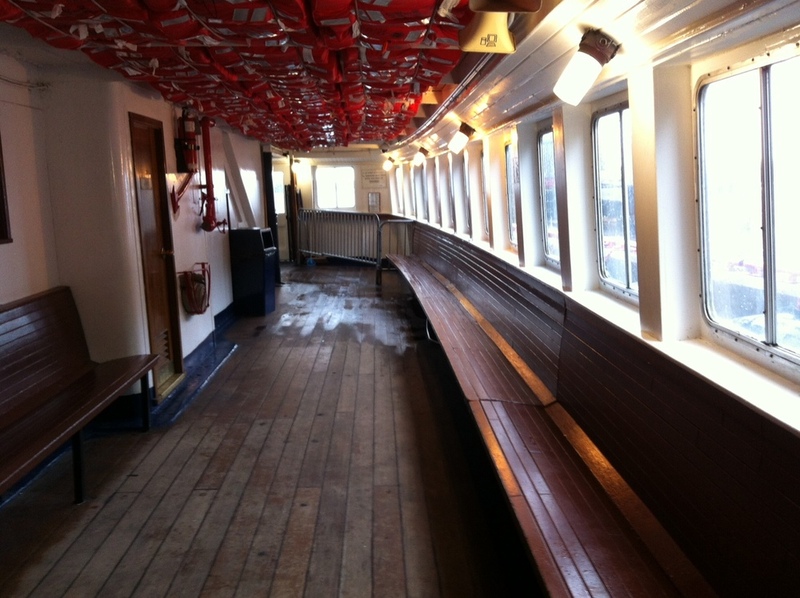 That I was the lone passenger on the ferry probably wasn’t the best omen, but it felt somehow Victorian, my bags on my lap on the damp bench with all those old red lifejackets tucked into netting overhead. Out the window the rain fell sideways. Victorian and writerly, right? Except I spent most of the ferry ride texting my sister. About my kids. On the western tip of the islands is Gibraltar Point. This used to be what we born-and-raised Toronto kids called The Island School. It is now an artist retreat/colony/work space run by Artscape, a Toronto non-profit. My lovely and gracious host picked me up at the island terminal then showed me to my private space, an old school portable converted into a studio. I was by myself, no children or obligations aside from writing for 2 whole days. The stuff of dreams. Yet as soon as my host pulled the door closed behind me, I texted my husband to say I’d be on the next ferry home. If it wasn’t for the pelting rain and the 25-minute walk back to the island terminal, I would have left. Stay, my husband wrote. You are not allowed to come home. He knows me well. Next came a walk on the beach with ocean-worthy storm surges. 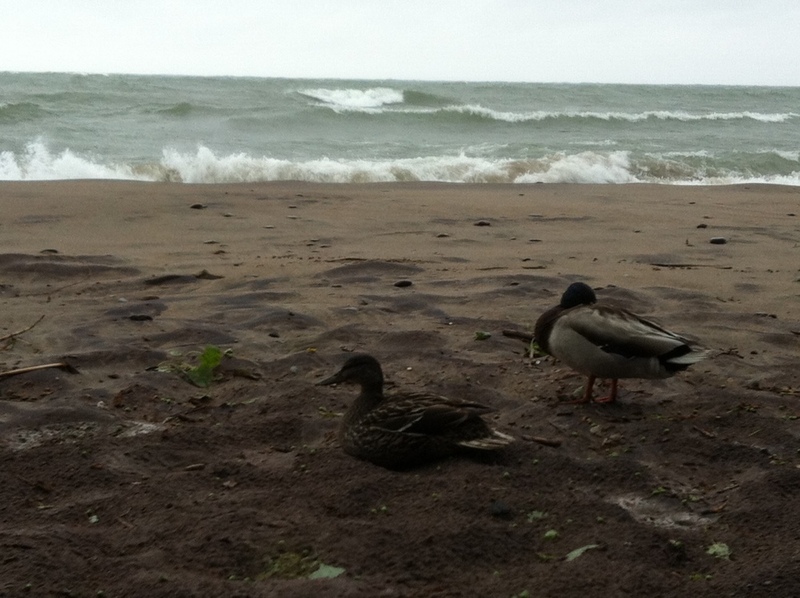 Two ducks sat on the sand with their wings shielding their bills from the wind. Instead of admiring them, I pulled out my Iphone and tried to secure a photograph to text to my husband, sisters, best friend and mother. I wanted to share even the mundane details of this experience with them. There were other people at the retreat. They seemed happy there, alone with their art. Some of them planned to stay for a month. These are people with the true artist’s temperament. Making art is life, and everything else is waiting for the next chance to make art. When I wandered over to the common space and struck up a conversation, they had trouble looking me in the eye, though they smiled often and asked me many questions about my work. My work. Right. I worked all weekend. In fact, I wrote almost 10000 words – a magnificent tally. But the entire time I longed for those people I so readily left. In the seven years I have been writing seriously, two things about me have changed. For one, I have developed my own version of the artistic temperament. It allows me to conjure my characters at any time, even when surrounded by the din of my children. I suss out their strengths and flaws by surmising how they might handle a standoff with my 3-year old, the true test of anyone’s character. When I am away from writing for too long, I feel strange, sad, edgy. This is my artsy side. I hide it well from others. The other thing I’ve learned, something I probably should have figured out years ago, is that I am not a solitary writer. I am not a solitary person. In fact, I’d go so far as to say that I hate being alone. So now, I google a different kind of escape. Somewhere with a house for my family, and then a shed where I can write. The perfect balance. Leave me be when I am writing. But when the writing is done, bring me back to my people.